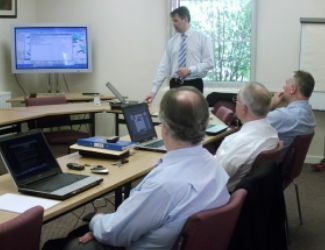 Even though our product are designed to be very user friendly and easy to use, many users will find that they would benefit from attending one of our training courses to gain better insight into how the system works and how they can maximise the benefits it offers their business. Regular training courses are held at our offices, or at training facilities around the country. Different course structures are available to suit everyone's needs; whether you require a beginners introduction, or a more in depth look at some of the advanced features, we will have the right course for you. Motex also offers a series of training manuals, that allow the user to work through aspects of the system in their own time. The manuals lead the user through areas of the systems in plain-English, easy-to-follow steps. After working through these manuals, clients will have a good understanding of how to operate the Motex products, and what the systems can do to help their businesses. Motex always provides very adaptive and flexible technical support, always endeavouring to ensure the Motex products and services fulfil our clients requirements. The Motex team is one of the strengths of the company, always willing to assist our clients with technical issues, training, and future development needs. Just read some of the plaudits from existing customers on our Testimonials page. With Motex you'll receive a second-to-none service, and support traceability through our unique online support system, Motex Support Manager, which has been designed to keep you abreast of support matters. If you require support for any Motex product or service, please do not hesitate to open a new support case within the Motex Support Manager and our team will be in contact soon. Alternatively, you can Contact Us by telephone or email, although opening a support case is highly recommended. Motex can provide Online Support through our remote access utility, which allows us to take remote control of a user's computer to fix issues. The above "Download Motex Online Support" button enables Motex technical support personnel to access your Internet connected system to provide online support. Download this utility only under the instruction of a member of the Motex support team.